Single-visit crowns are a reality with the use of CAD/CAM (Computer-aided design/computer-aided manufacturing CEREC technology. Single-visit crowns are used to treat decayed, broken or damaged teeth in one day, without the need for a follow-up appointment. This advanced technology is not always available at every dental practice, which is why Eastwood Dental is proud to be fostering growth and innovation in the field. CEREC allows the dentist to scan or photograph teeth and then manufacture porcelain crowns/inlays/onlays on the premises. This means that our patients leave the clinic with teeth that have been restored to their strong, durable and natural functionality and appearance. Prior to CEREC advanced technology, an impression would be taken of the prepared tooth, a temporary acrylic crown made and cemented, then the patient would need to return to the clinic after one to two weeks to have the permanent crown fitted. Inlays, onlays and crowns are all used to reinforce weakened teeth. These treatments can now all be done in one visit, most of the time, with the CEREC CAD/CAM technology. 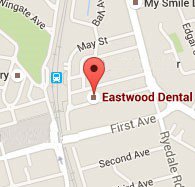 Book an appointment with Eastwood Dental today for more information on CEREC single –visit crowns, call 9874 9900.